Humpback whales were once hunted to the point that they became endangered, but several decades ago, international laws were enacted to protect them, and they rebounded—these measures were so successful that the U.S. National Marine Fisheries Service took the whales off the endangered species list back in 2016. But now, it appears the whales face a new threat—climate change. 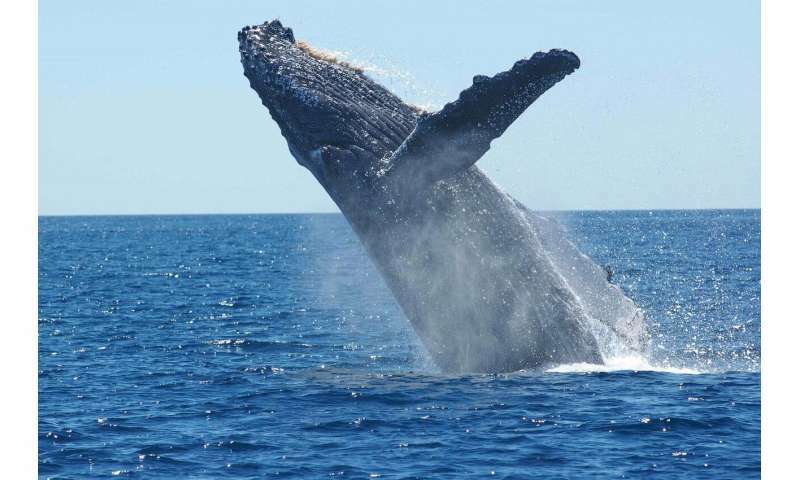 In a new effort, the researchers studied the reproductive habits of humpback whales that migrate between the waters off the Alaskan coast and those that surround the Hawaiian Islands. They had noted that in 2013, a giant mass or "blob" of warm water had formed in the Gulf of Alaska, and over the course of the next six years, slowly made its way south. Prior research had shown that temperatures in the blob were up to 3 degrees C warmer than surrounding water—high enough to kill krill and other sea creatures that serve as food for humpback whales. This led the researchers to embark on a study of the impact of the blob on the humpback whales. According to prior research, when female humpback whales have insufficient food to pack on blubber, they stop ovulating. And if ovulation does not occur, a female will skip the migration season. In studying the whales, the researchers found that fewer females migrated when the water was warm, which meant that fewer whales were born. They were not able to pinpoint the actual number of births, but report that over the years 2013 and 2014, they counted one mother and calf pair for every three kilometers of ocean. In contrast, they had to search over 12 kilometers of ocean in 2017 and 2018 to find a mother/calf pair. The researchers report that the blob has finally dissipated, but point out that its presence provides a glimpse of what humpback whales could be facing if the ocean warms as predicted in the coming years due to climate change.